More information can be found at the Centennial College program overview page. In addition to regular course work, students in the program have attended the annual Ontario Museum Association conference, events at the Royal Ontario Museum, and a number of other events, talks, and presentations throughout the Greater Toronto Area. Students in the program come from diverse backgrounds and have already earned degrees ranging from Bachelor’s of Arts in English to Archaeology. 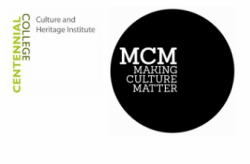 Culture and Heritage Site Management (CHSM) is a 1 year post-graduate certificate program at Centennial College. This program teaches students well-rounded skills that they will need to become valued contributors in the arts, culture, and heritage sector. This includes engaging current leaders through discussion and individual field placements.